On my Waitrose excursion, I also wanted to get some lunch. Especially since I haven’t been out much at all for a bit because I’ve had a cold, which made me not want to do anything. Today, though, I was feeling better. And I wanted to have a decent lunch. Well, I had much more than a decent lunch. 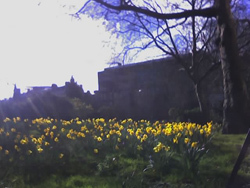 I wandered around the area surrounding the Waitrose for a while — it was beautiful, with lots of parks and daffodils in bloom and white buildings with columns out front. I wasn’t too far from my place, but the neighborhood felt very different. I believe I was in Belgravia or Kensington. Across the street from the Waitrose were a few coffeeshops and a deli, but the prepared food just didn’t look that great to me. There was also a nice-looking Indian place called Amaya. I was a bit underdressed, but I decided to check it out. 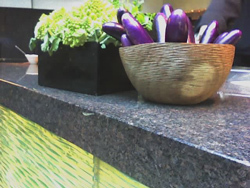 The restaurant was pretty large, with a nice warm bar by the door, lots of natural light and some cooking happening on the far walls, with luscious displays of vegetables. There was an extensive specialty drink list, both alcoholic and non — I’ll have to go back to try some out — and everything on the menu looked so good, I ended up getting a veritable veggie feast. The meal started with a slightly spicy green mango and papaya salad, which I really enjoyed. The pansies on the plate were a great touch, too. Once I was done with the salad, though, it seemed like the dishes just kept coming out! There was some paneer tikka, which is always one of my favorites, and a great fig and vegetable patty and some sweet potatoes with sauce. There was also some broccoli with a yogurt sauce, which was my least favorite dish — the broccoli was a bit overcooked and it was a much larger quantity than any of the other dishes, which was just incongruous and unappetizing to look at. There were some stuffed little chilies that I really liked, which were surprisingly sweet, no hot, and there was a veggie roll of some sort. The dishes were all served with a side of chutneys — one rhubarb and one tomato, which were both really delicious, and a peanutty spice powder and a rose and lavender powder, which was wonderful. 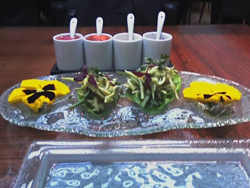 All the dishes were presented really beautifully as well, on plates of various shapes in white ceramic and glass. There was also some grilled mango and a sort of passionfruit smoothie for dessert, which were nice and refreshing. Overall, a very extravagant lunch, but a fantastic, relaxing experience. Definitely not the packaged sandwich I thought I’d be getting and well worth it. I can’t wait to go back and bring Evan. I hear someone at the table next to me saying it was like a totally different place at night. And I can see that without the sunshine pouring in and with all the candles and mod lighting around, it would be a great romantic dinner spot.